Update 3 Dec, 2015: We’ve updated our review with our thoughts on Legacy of the Void’s multiplayer components, which you can read below. Over on page two you’ll find our Legacy of the Void campaign review. What I think of playing StarCraft 2’s main competitive multiplayer component is irrelevant. In fact, what you think of it is likely irrelevant too – there are around 200 people, worldwide, that have the authority to give opinion on how it is to play and most of them, if not all, have a direct line to Blizzard. Usually, Blizzard Korea. Which units are too strong, which build orders are too weak, who is favoured against who, where, when, how and why. I’m not expert enough to judge these things and I’ve long been aware that I never will be. It is a game for the elite, custom designed for single individuals to practice and iterate and practice and iterate until they’ve eked out every possible advantage, every timing window, every piece of trickery – only to discover their opponents have one-upped them anyway and they’re a game down. It’s not a formula that Legacy of the Void redesigns, but it does provide the largest shake-ups in its history through the changes to how economies operate. Games now begin a little further down the road, with the first six workers that were produced in 99.99% of all matches played before now sat ready and mining minerals when you load in. That means you’re making meaningful decisions more quickly, and also shortens the average game length by a couple of minutes. Like I said, I am not an expert at playing StarCraft. But vitally, these changes make the game infinitely more fun to watch. There’s less dead air for commentators to fill at the start of a match. Games progress more quickly to tests of skill and moments of interaction. I’ve seen them as short as two minutes, rush strategies that are now actually quick rather than watching foregone conclusions play out slowly. It’s brilliant, and exactly what the game needed to remain relevant even as it flags to the bottom of the e-sports pile on. Backing that up are alterations to how many resources are available per base, each reduced drastically in the total it will provide and the number of workers needed to efficiently gather from it. This means it’s less viable to stay on a single base, but each expansion isn’t as valuable. It pushes players towards conflict quicker as they consume areas of the map to fund their war effort. This can’t be overstated: that’s a desperately needed change. Professional StarCraft in Wings of Liberty and Heart of the Swarm had a habit of devolving into macro-fests of players never attacking each other’s maxed out army while they banked resources to create reinforcements when the engagement did happen. Games would lull as deathballs of forces danced around each other for minutes at a time. With mid-game attacks now more incentivised and late-game turtling a recipe for disaster with dwindling resources, there’s a lot more getting in there and a lot less sieging up. This push to make games more exciting is present across the board. Every new unit is equipped with micro-heavy abilities that prove devastatingly powerful when used properly, but have specific ways to counter with good play, rather than unit choice. In general, they reward aggressive control and smart engagement at key moments rather than turtling. Even the Liberator – a new Terran flyer that is basically a Siege Tank with wings, a design so ludicrous I’m fairly sure I came up with it on a school notebook in 2003 without a single thought for balance – wants you to use its fields of fire as support zones while pushing forward. 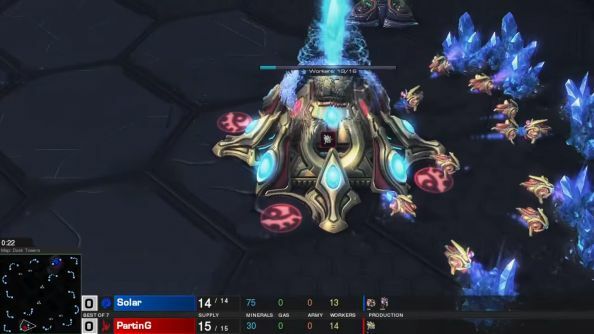 The Protoss Disruptor has been the pro-game all-star so far, firing off directed energy balls that explode for incredible damage after a short time. Microing the ball towards an enemy force while controlling your other units is a challenge, as is splitting forces to avoid it for the opponent. 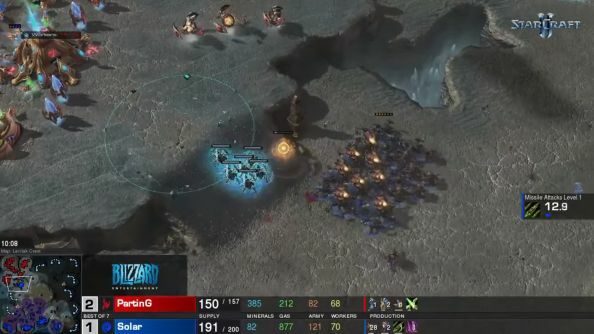 The satisfying pay-off of a decent disruptor hit taking out twenty stacked units makes for a great spectacle, be it for players or watchers. Part of this enjoyment, clearly, is coming just from the fact these things are new. That’s not a problem as much as it once was. In the past, Heart of the Swarm brought a massive influx of players and viewers back to the game, but things died down as new strategies became standard and innovation was lacking. With Blizzard’s commitment to regular updates, they can stunt that decline with annual major patches, restarting the cycle. This isn’t something to decry. 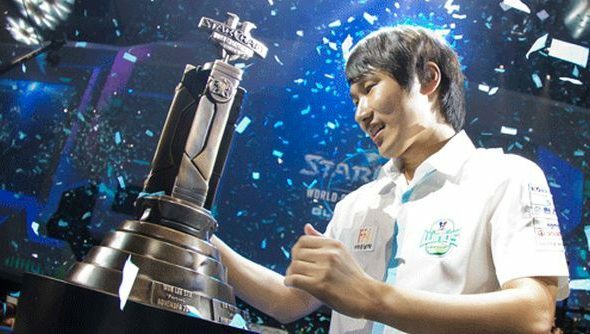 Street Fighter, Dota and League of Legends all make major events out of their yearly updates, revitalizing the professional scene for another season and bringing players flooding back. It’s just not possible to keep people interested in the same game, played in the same ways for an extended period any more – even Counter-Strike has been patched this year, and will need to continue to be to maintain its glory. Some things, however, can’t be fixed. It’s still possible for games to devolve into 200/200 population armies that don’t want to go near each other. If you’ll excuse an old Brood War fan’s ranting, I’m not sure that’s something an RTS made with modern UI and quality of life design could ever prevent. The path of least resistance is always to continue to efficiently produce units and command them as one. Armies move too smoothly around the battlefield, group up too nicely, special abilities are too easy to use compared to the days of single-building selection, maximum group sizes and no tabbing between units of different types. Even the pathing AI plays its part, no longer locking units in formation for unknown reasons, or unable to navigate simple ramps with large units as it was in the late ‘90s. Without these very basic usability barriers – which, let’s be clear, you cannot put in a modern game – it’s simply inevitable that stalemates will be more common between players trying to find small openings. Traditional multiplayer is supported by a pair of new modes, Archon and Co-op. Both feel like attempts to bridge the gap between single-player and multiplayer that have spun off into their own things, but remain oddly tied to those original intentions. It’s plausible to me that two-people-one-base Archon mode could replace 1v1 as the defacto competitive way to play if a big enough community grew around it. It’s unlikely it will ever usurp the throne, but the things that are possible with two highly-skilled players at the helm of one hyper-efficient, super-mobile army are impressive. Forget the pitch that it could be a teaching tool for newer players – this is as cutthroat a competitive mode as any, and you’ll find little quarter from opposing pairs if you’re trying to advise a friend on how to play. I’m looking forward to how it develops, and the influence seeing the technically possible from duos will have on solo players attempting total mastery. Co-op, or Allied Commanders as it was originally known (the name having stuck as only quickly-revised but nevertheless already-announced names can), is an entirely different beast. It is a literal halfway point between the campaign’s structured mission design with overpowered forces and multiplayer’s timing-based build orders from identical starting positions, influenced by whatever individual map this game happens to be on. However, it functions neither as a satisfying team-based version of the former nor an acceptable way to take steps towards the latter – it’s something new. That’s great, even though it leaves multiplayer StarCraft as impossible to learn as ever. Each of the commanders have a suite of special abilities that modify the faction they’re playing, and only have access to a subset of units, letting you focus in. As you play more missions with them they level up, getting access to more powerful abilities, both active and passive, and more units, further diversifying them from the regular factions. It’s a fun thing to work through, but with only five missions and six commanders with linear progression, even the easy joys of partnering with a friend over waiting for a random companion aren’t going to maintain your attention for long. Difficulty has also been a sticking point. I am not a particularly adept player, but was managing to win missions on Hard despite playing a race I’m unfamiliar with that had nothing unlocked. A quick glance at recent community feedback will tell you this is true for at least a vocal portion of the fanbase too, especially once you’re operating as a coordinated team that complements itself. It is an area of the game I’m excited to see grow, adding in many more missions, perhaps some sort of connecting storyline despite Blizzard’s initial resistance to the idea, even if it ends up making about as much sense as Heroes of the Storm. More Commanders, perhaps controlling units that don’t belong to any faction in either half of the game like Hybrids, Primal Zerg and other neutral forces. Give me customisation options akin to talent trees, letting me change how I approach different missions, and make that necessary with an additional difficulty level that will push a pair of reasonable players to really coordinate. Both new modes fill a niche and are a lot of fun, however, and the game would be one of the best out there and my personal favourite of the year even without them. 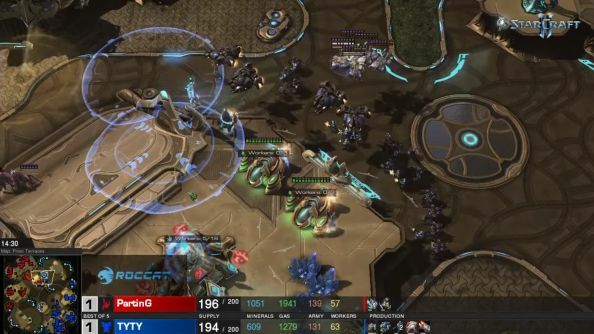 The RTS genre will live on in StarCraft II for a long, long time and while it would have been impossible to have the knowledge to do so at the time, if it had launched as it is now, the e-sports landscape would likely be very different. For fans of strategy, professional play, space opera or just good games alike, it’s essential. Some images taken from the Dreamhack Winter 2015 Legacy of the Void championship stream. On page two: ourLegacy of the Void reviewof the campaign, story, and the end of an era. I’ve been waiting to write this review for about fifteen years. As the in-game achievement for completion says, it’s the end of an era. 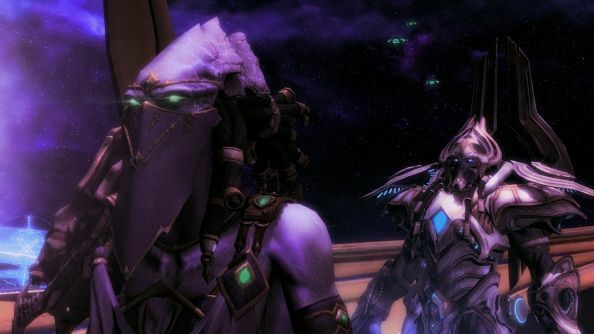 While StarCraft II will continue to receive updates in Blizzard’s now-constant flow of content patches across all their games, Legacy of the Void’s campaign has been pitched as the finalé to the storylines that have been running since 1998. Endings are a weakness across the industry, so I was apprehensive as to what they could do to make it feel as climatic, entertaining and fun as it needed to be to tie all that off. Thankfully, Blizzard have figured out the formula for a satisfying conclusion. Legacy of the Void never goes small. SC2 already did that in its previous iterations. It had Raynor’s marine squad blowing up the odd billboard on Mar Sara in Wings of Liberty. 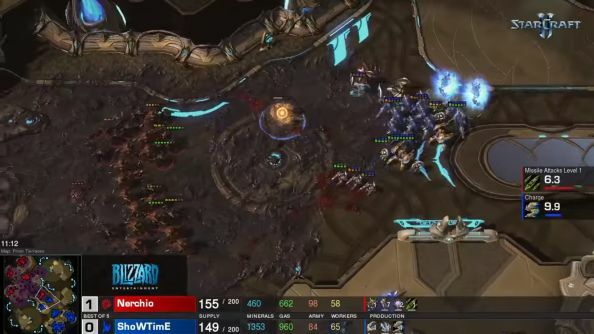 Kerrigan’s swarm was just a Hatchery and some Zerglings at the start of Heart of the Swarm. The Protoss don’t have time for it. 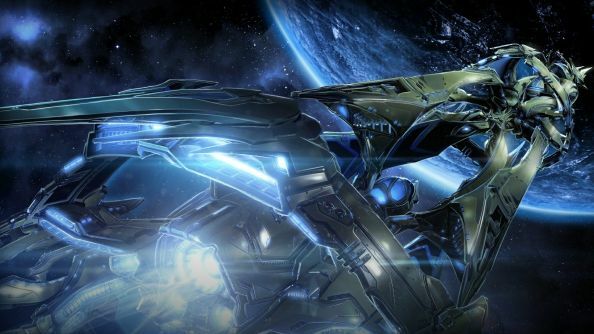 Main toss-man Artanis has already gathered his Golden Armada of warships, towering robots and endless armies to reconquer the homeworld and that’s right where you begin, controlling a huge force as it charges around slaughtering Zerg by the hundreds. By the videogame laws of progression and introduction things naturally don’t stay that way, but after your massed forces are inevitably annihilated by plot, the scale stays the same. Every mission is set up as and feels like a desperate battle to save the universe. You’re constantly besieged on all sides, or barely stopping apocalypse-tier disasters, or even causing them. While your choices in the non-linear structure may mean it comes later, basically the second thing I did was blowing up an entire planet because it was the only way to stop an advancing horde. It’s got that Mass Effect 3 darkness to it, constant reminders that everything’s screwed unless you get this right and even if you do, millions are dead anyway. While I’m well aware how I’m setting myself up bringing that particular game to the fore when complimenting the ending of a trilogy, it’s the best comparison – a space opera that takes a sudden turn for the gritty, something diehard fans have been begging for since StarCraft 2’s first installment and its overarching love story. I didn’t have a problem with the game’s plot up until now, taking the cheesy space-cowboy ridiculousness of it as deliberate and liking it for what it was, but the turn is appropriate here, at the end. 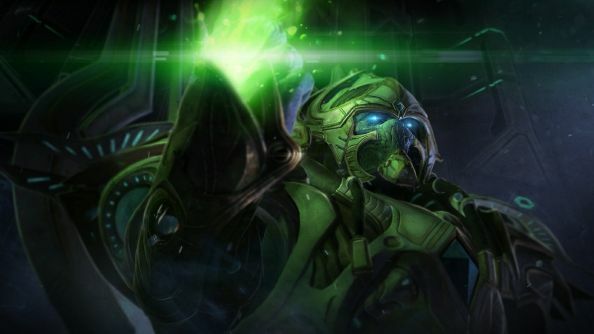 Mechanically, being vastly outnumbered doesn’t bother the Protoss, who take the small in number, high in firepower role in StarCraft’s trio of factions. They’re custom-built for it with high-health units, regenerating shields and monstrous long-range, AoE-attacks. In this version, Blizzard have really taken the brakes off their balance design, giving you immediate access to monstrously powerful units to compensate for the elite Zerg-Protoss hybrids fielded regularly by the AI. Take the Zealot, the faction’s most basic unit – just one of its possible variations here stuns all enemies in an AoE whenever it engages in combat, letting you guarantee first strike, better positioning, and probably permanent crowd-control if you’ve better micro than I.
It’s all like that. War of the Worlds-style mecha Colossi that set the ground on fire, burning anything that steps on it for extra damage. 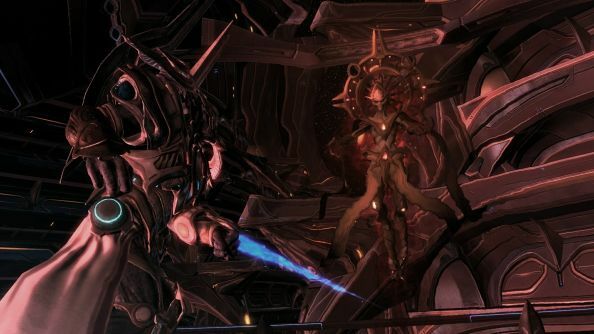 Returns of fan favourites like the Dragoon and Reaver of the first StarCraft, filling the roles of long-range tank and siege weapon respectively. It’s a smorgasboard of fun options, and I switched between them and used far more varied force compositions than in either of the previous campaigns. Even when I thought certain options were obviously superior, I’d see others in action or be forced to use them for a single mission and end up appreciating their benefits. This willingness to change comes down to there not being any permanent choices involved in customisation. Every unit has three variations and you can pick between them at any point when you’re not in-mission. In the Terran and Zerg campaigns, there would be choices made that couldn’t be reversed, but here that’s been taken out without any noticeable drop in the power of what you’re given to command. It’s a shame the first time you’re introduced to a unit in a level it comes uncustomised, especially since that’s usually when you’ll be getting the most use out of it. Also unfortunately, the majority of them all contribute best in a deathball strategy of massing as many units as possible and attack-moving them across the map until everything falls over. Mission design does its best to alleviate this, but only really succeeds when it takes bases or unit production away. However, I never did find an all-encompassing unit or two that won all fights, so there is at least variance in your destruction. Plus, things are probably different and require more finesse on the higher Brutal difficulty. The Spear of Adun flagship is the campaign’s ‘hero-unit’ though it never appears directly on the battlefield. It uses a special resource gathered from side-missions to power the star that sits at its core. This gives you access to special abilities that run on a cooldown and regenerating energy system. Similar to how Kerrigan operated in Heart of the Swarm, this means combos of special abilities and always-active passives. The Protoss flavour is such that this comes in the form of warping in Pylons and units (from space), providing healing to mechanical units and structures (from space) or blasting the map with laser lances (from space). It’s not quite at the same power level Kerrigan was, deliberately according to lead designer Jason Huck, but trades that in for more powerful activated abilities rather than a constant map presence. It is lacking in one specific area, and that’s abilities that decrease set-up time in each mission. It has the automated geyser upgrades that were available in both of the other factions’ campaigns, but sorely misses the double-worker production that was also in previous single-player iterations. This means that far more of the start of each mission is spent maxing out your Probe count than building units, amassing an army, choosing upgrade paths and generally having a fun, enemy-slaughtering time. 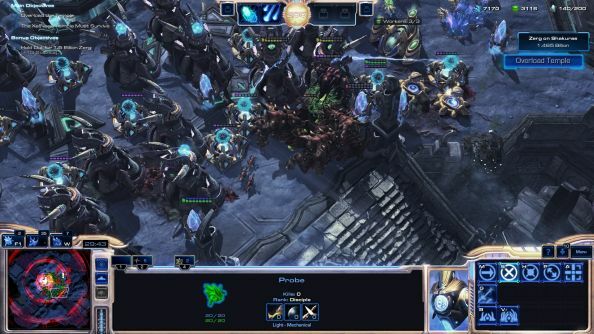 The nature of the way the Protoss spend resources – in large waves thanks to warp-in cooldowns – means it’s harder to expand as well, so in general you feel poorer and less able to do what you like than you did in Heart of the Swarm with the fast-building, cheaper Zerg. The balance of selecting abilities on the Spear of Adun is slightly off as well. You use the resource, Solarite, to power different sub-systems. However if you want the most Solarite-expensive ability, you don’t get to keep the other two on that sub-system. So of 18 options you only end up with four active abilities and two passive ones, plus three variable factors that are meant for ‘spare’ Solarite you can’t spend elsewhere. 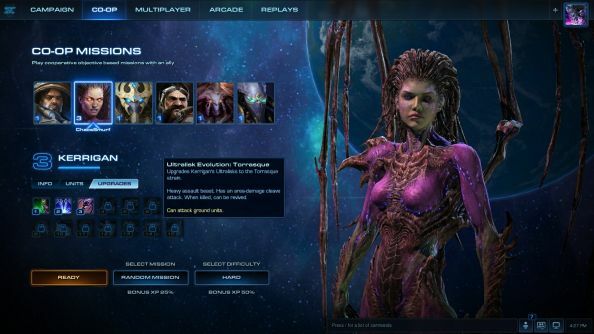 Versus Kerrigan’s huge suite of upgrades or the Terran’s ability to pick and choose where money is spent on which units they’re planning to use throughout, it’s a lower power-level and feels less special. However, this did leave me varying my choices throughout the campaign as I experimented with optimal builds, so the limitations were appreciated in that way. Lacklustre army issues are mitigated by the excellence in mission design, though. Other than a slight reliance on defend for time or until thing happens objectives – and one particularly egregious reuse of ‘don’t let them touch the arcane super-tech wand before it charges its world-saving blast’ – they’re fantastic. Objectives are interesting and related to what’s happening in the plot. Areas are visually distinctive and each feels like an actual place rather than just another skirmish battleground. There’s great pacing in how different opposing forces will be in one level to the next, and every time I felt like not building a base, a commando mission would pop up, giving me ludicrously powerful heroes to play with instead of the usual troops. Like Wings and Swarm before it, Void proves once again that an entertaining and diverse single-player RTS is not only doable but a refreshing change from standard 2015 video game fare. In a year where I’ve heard ‘I just want an 8-12 hour game without thousands of collectibles’ about a hundred times, it’s filling a niche we’ve been waiting for. It’s helped along by a plot more jam-packed with Blizzard-quality cinematics and great voice acting than anything they’ve done before. Along with the beneficial tonal change I mentioned previously, I think the line by line writing has straight-up improved too, and John de Lancie proves a particularly excellent addition to the cast playing his most familiar role of ‘Alien Dickhead’ with all the arrogance and gravitas you’re accustomed to. Legacy of the Void, in true Blizzard fashion, doesn’t break astounding new ground but does build expertly on what’s come before. With an ending so ridiculous I couldn’t help but love it, including three of the finest levels ever put in a strategy game, and a plot that never lets up on twists and went brilliantly unspoiled in marketing materials thus far, I don’t know how else I would have put the series to rest. No matter your experience with the RTS, StarCraft 2’s campaigns are only matched for value and fun by one another.